This post is dedicated to all the hospitality establishments outside of Accra or for that matter Takoradi…. This FB conversation took place the other day. It’s not the first time the venerable Professor Anyimadu and I have NOT seen eye to eye. I have the Coffee Corner to myself, well, except that the US Navy is here too, Training Ship in Sekondi. 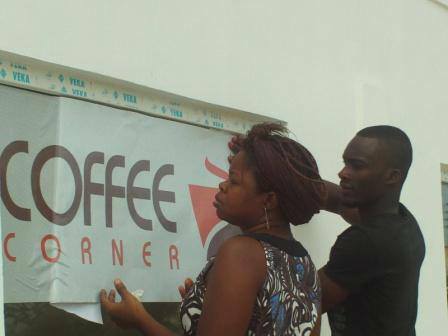 They found out on the web that Coffee Corner is number one. That is true and it could be my post. Amos Anyimadu Sir, I would not want to argue too bluntly with you because of your age and good works. Factor in what the pirates are doing to our Gulf of Guinea. Over time I have learnt not to continue Facebook conversations like this…they go nowhere.. But pursuing the topic on my blog allows me to share it with the 400+ SCRAP SHORT TERM TOURIST VISA TO GHANA Facebook group members. So, to keep this short..wt_ does pirates in the Gulf of Guinea have to do with international leisure tourism to Ghana? Incidentally, I can’t give you a link to Ghana Tourist Coach FB group because I was banished from the group unceremoniously. All these red herrings… WHY? And oh yes, my age? what’s my age got to do with anything? And I’m still scratching my head about “good works”…. flourishing tourism industry? No! But what does have a positive influence is the absence of tourist visas.